In the perception of many naval architects, a ship’s safety needs translate into its structural requirements. Consequently issues such as the safe and effective evacuation of a vessel, and ensuring that evacuation points are optimally placed, come secondary and treated as something of an afterthought during the design stages. This would be a concern on a merchant ship but for cruise ships or ro-paxes, where passengers may be elderly or have restricted mobility, it represents a particular problem. Danish-headquartered manufacturer Viking Life-Saving Equipment is keen to impress upon ship designers the value of consulting with safety specialists when it comes to the effective placement of Marine Evacuation Systems (MES). In addition to its recent acquisition of lifeboat manufacturer Norsafe, announced at SMM in September, this year has also seen the commercial rollout of its LifeCraft concept. As the name suggests, the LifeCraft is a cross between a liferaft and lifeboat and designed with larger cruise ships in mind. Equipped with four battery-driven engines of 5.5kW each, as well as thrusters for sideways movement, the LifeCraft offers the advantage of compact storage by comparison with conventional lifeboats. Moreover, each LifeCraft can be connected to three other units (each holding up to 200 persons) to create a ‘LifeCraft system’ capable of holding 800 passengers and crew. The Naval Architect spoke to Niels Frænde, Viking’s VP Sales, Cruise & LifeCraft, about the kind of practical safety and evacuation advice an equipment manufacturer can provide during the design process. Ideally, at what stage during design should naval architects be consulting with Viking (or other similar equipment providers) about the evacuation planning for vessels? The ideal stage is in conjunction with laying out the major life-saving appliances (LSA’s, in particular the MES and lifeboats) arrangement. In a traditional arrangement, you need to consider which of the equipment types should be positioned forward, at the centre or aft. From a functionality point of view, the MES is usually best located in the centre of the LSA arrangement, because the liferaft part of the MES is likely to be sitting at water level for a certain period of time while passengers and/or crew are being evacuated. Placing the MES forward or aft is likely to see the liferafts take more of a battering. This way, placing it in the middle is also an advantage for the comfort of those waiting in the liferafts for others to come down. Lifeboats are more flexible, in terms of where they can be launched from, because they are designed to be fully loaded before being lowered into the water. However, for lifeboats too, the forward and aft positions are the most problematic from a safe launch point of view. That said, both MES and lifeboat systems can, in fact, be located freely wherever on the vessel they are needed – there are no [SOLAS] restrictions on placement. The Viking LifeCraft can take any position along the deck, as it is motorised, enabling repositioning once in the water, and because it has a fully intelligent list and trim system to enable it to adjust to the ship’s own degree of list and trim in an emergency. Typically, how can a vessel’s operational profile impact in terms of the regulations/requirements for evacuation? Generally speaking, the vessel’s operational profile doesn’t have a great influence on regulations/requirements for evacuation because these are guided by clear rules governing the types of equipment demanded and the combinations of different equipment types. These rules are, of course, important to consider in their entirety in relation to an LSA arrangement. As a supplier, we work very closely with naval architects to determine the optimal way to answer both regulatory and functional requirements. That said, there will be some preferences that impact upon LSA designs. For example, international ferries with a short course of call are likely to want to keep the number of lifeboats on board to a minimum, avoiding overhang and reducing the need to conduct drills. Vessels on longer voyages have longer ports of call and therefore more time to perform the necessary drills. What are some of the common areas of confusion you encounter with ship designers (and owners) when it comes to incorporating evacuation plans into their designs? There are many regulations that affect onboard evacuation systems. A lot of consideration must be given to the percentages of the different equipment types on board, for example. As ships become larger and longer, with more passengers, more equipment is needed and a longer area is required along the ship’s side for evacuation. This, in turn, leads to greater impact in terms of list and trim – and the rules and calculations for this aspect can become very complicated. You need to execute a lot of calculations to work out whether the LSA arrangement will work at, for example, 20° of list and 10° of trim, keeping equipment as low as possible to the water, naturally, but still being able to keep it away from green seas. Part of the entire equation is the provision of good drop zones for LSA equipment – and then there’s the float-free aspect, making sure that float-free functionality isn’t hampered by balconies or caught under the deck if the ship is sinking. Here we have to work intensively to ensure regulations are followed and that we’ve worked through all the possible scenarios. Viking has specialised knowledge and vast experience in this area, so it’s useful for us to partner up as early as possible to help determine what is correct and optimal. How long has Viking been developing the LifeCraft concept? Work began in 2009. When you want to do something that challenges the status quo, challenges regulations and everything else, you need to have a very extensive and thorough development process, allowing you to test every aspect intensively. Over the years, we’ve built and tested more than 50 complete prototypes of the craft, and we’re now at the final version – the third generation of the design. Because we’re developing outside of the SOLAS regulations, we need to be immensely thorough in our approach, perhaps even more so once the design is ready to work with the classification and flag processes. One of the advantages Viking has been pushing for LifeCraft is its compact storage. 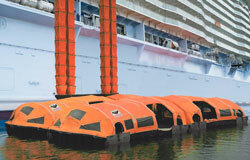 Exactly how much space can be saved compared to traditional lifeboat/raft/MES solutions? This is indeed the case. And the reason is simply that, when you consider the passenger capacity of the Viking LifeCraft, the required length along the shipside for the equivalent capacity is around 30% less, and on big ships, you’re often running out of room along the side. When it comes to sheer deck space, the savings amount to no less than 85% when compared to a traditional setup! While the extra space can certainly be used for additional cabins, it seems operators are even more keen and focused on utilising the safety gains offered by a LifeCraft based system. Also, some cruise operators would even like to have the idea of a promenade deck back, enabling the offering of different concepts and space for relaxation for the passengers. Has the LifeCraft received flag or class approval? We have finalised harbour and several high-seas tests along with other trials on the LifeCraft unit and submitted test documentation, so the Viking LifeCraft unit is soon expected to get flag approval with its first flag state. LifeCraft has been developed with cruise ships in mind – could it also be used on polar expedition ships? In its first versions, the VIKING LifeCraft is not aimed at polar vessels. From an operating temperature standpoint, however, nothing prevents the craft from going polar (up to the PC 6 designation). That said, using the LifeCraft for polar expedition ships is not likely as these are normally smaller vessels and the LifeCraft has an 800-person capacity (so there needs to be 1,600 people or more on the ship before it really makes sense). How much interest has there been in LifeCraft so far? Whenever something truly new appears on the scene and offers completely new standards of safety then it quickly captures the attention of flag states, classification societies, shipyards, vessel operators and so on. The Viking LifeCraft is no different – we’re receiving plenty of interest and enquiries from all of the large cruise lines and others whose ships could be suited to this new type of craft. Some of these enquiries are more serious than others, as there are always trendsetters in the industry – and they are currently exploring the details of installation with our technical experts. Following industry practice, we are unable to name these operators or be more specific about installation plans. Fuelling this strong level of interest is the lively debate around lifeboat safety. With boats carrying up to 460 people these days, and accidents continuing to occur (though at a lower level than before the recent Lifeboat Release and Retrieval System (LRSS) regulatory update), alternative evacuation systems have become a hot topic. Alongside the safety issue there are a number of practical aspects that are seeing some shipowners and operators trying to reduce the number of lifeboats onboard. For example, vessels passing through the new Panama Canal need to minimise overhang. And this overhang, typically two to three metres on either side, is also a potential problem that affects port operations, too. The Viking LifeCraft answers a long list of such issues, and it certainly provides a slicker design for the ship’s side!